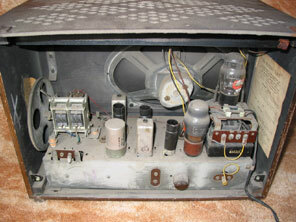 Shown here is the model 1121 from 1950. Now this really is an imaginative design of radio. Ever since the start of commercial radio manufacture it was a given that the speaker cloth and the tuning scale were two essential elements of a radio that need to be placed somewhere appropriate on the cabinet, normally next to each other or above/below each other. 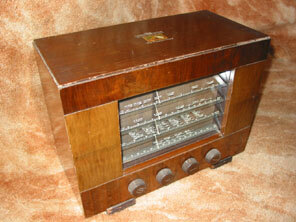 At first glance it might appear this radio does not have a speaker grille, but it is in fact behind the tuning scale. There are four glass louvres (or slats) at the front of the cabinet, and each of these provides the scale for one waveband (LW, MW, SW1, SW2). Each glass louvre has its own cursor, though of course all the cursors move together. Four lamps are provided inside the cabinet, and are mounted such that the glass transmits the light along its length from each end, thereby making the screen printing of the stations appear to glow. There were one or two downsides to the design of course. For one it was harder to remove the chassis, as the cursor mechanism remained in the cabinet, so therefore had to be disconnected from the main chassis by the disconnection of bolts etc. That said it would have been only occasionally that there would be a need to remove the chassis, as a removable inspection panel is provided in the receiver base that permits access to most components. The two inche strips of unsupported glass are by their very nature more vulnerable to damage than a more conventional scale, and tend to become dirty on the underside in a polluted atmosphere. This gives the risk of an owner cleaning the glass underside with excess vigour, and thereby removing the station names as well as dirt build-up! The design sold quite well though, and the idea appeared again in 1953 as the 1124 receiver, in a darker cabinet with white knobs and scale surround. I personally dislike the later version though - it seems to have crossed the line into "tacky". The first version pictured though, with its rich walnut cabinet and simple lines that highlight the great tuning glass design idea, is a classic. As the receiver is a standard 4 valve plus rectifer set, it was rather expensive at £23.2.0 compared to the competition, but the stylish cabinet ensure it sold well. Valve line-up is X78, W77, DH77, KT61, U10.